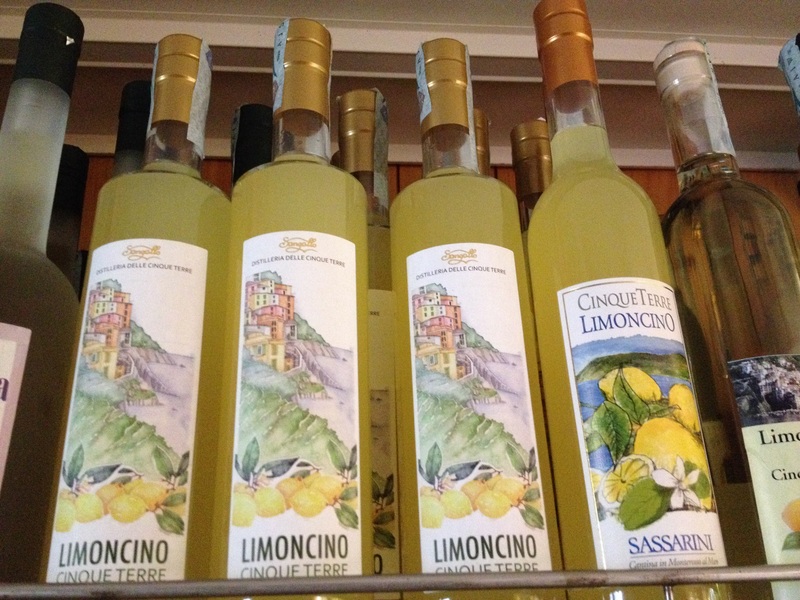 So, you may be wondering, what are the local specialties in the Cinque Terre? While focaccia has become quite international, Liguria (the region in which the Cinque Terre villages are located) is its true birthplace. Even within Liguria recipes for focaccia vary. For example, in Genoa focaccia is lighter and more bread-like, in Recco it’s very thin and filled with stracchino (a soft, mild cheese) and in the Cinque Terre our version tends to be more Spezzino (similar to that made in the nearby city of La Spezia). Whichever way you find it, it’s pretty delicious. There’s a plethora of topping options so you could potentially eat focaccia each day you’re here and still not tire of it! 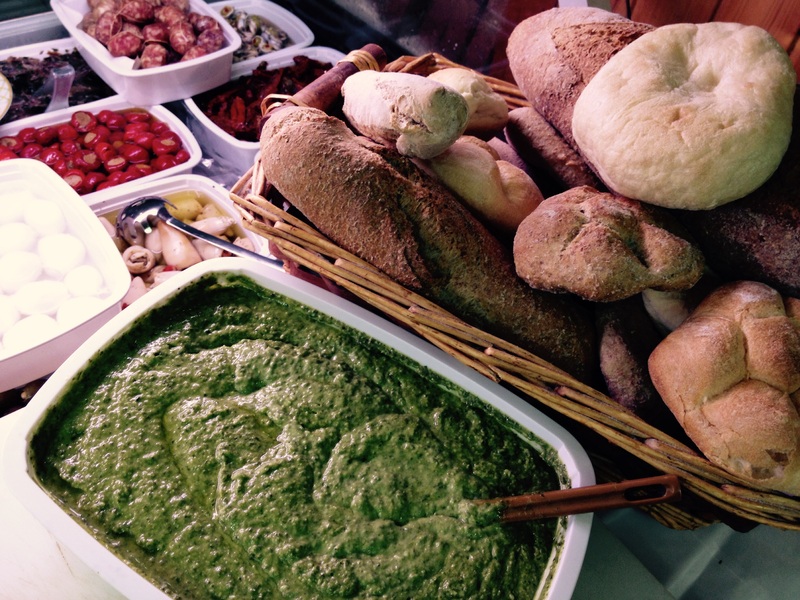 Our region also boasts pesto as its own creation. Something about this concoction made from fresh basil, pine nuts, garlic, parmigiano, pecorino cheese, olive oil and salt is incredibly addictive. When others aren’t looking, I secretly use fresh pesto as a dip on bread (shhhhhhh!). You’ll find fresh pesto sold by weight (by the way, there’s no comparison between fresh pesto and what you’ll find in a jar) in many of the local alimentari (small grocery markets) or you’ll find it served in just about every restaurant or trattoria in our area. Pesto is usually paired with trofie (characteristic pasta from this area, they look like little twists and are served al dente) or trenette (which look similar to spaghetti). Don’t be surprised if your pasta al pesto is served with potatoes and/or green beans, it’s actually how most locals eat it! We are located directly on the sea, so it should come as no surprise that seafood is a local specialty. Don’t shy away from the acciughe (anchovies) just because the word makes you think of the tin can version. 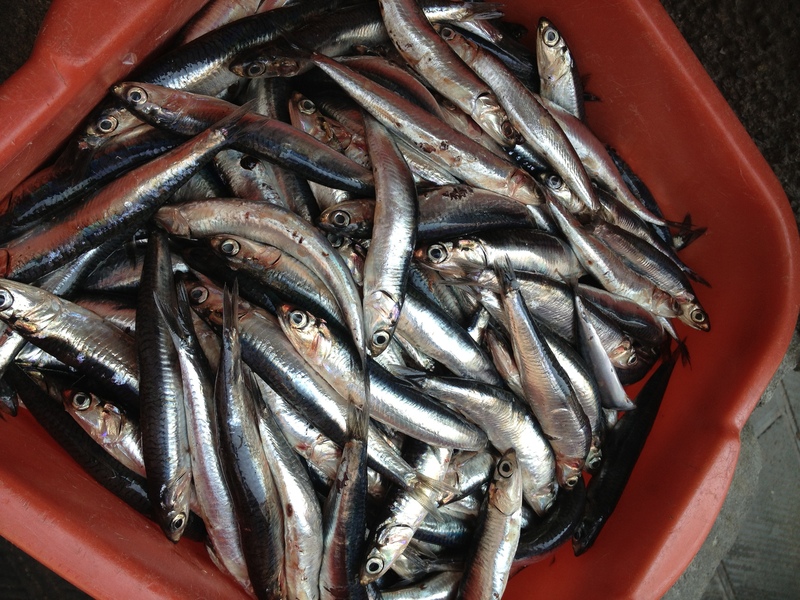 Anchovies from the Cinque Terre (and in particular, from Monterosso) are famous throughout Italy. You’ll find anchovies in just about every variation imaginable here: stuffed, fried, cured in lemon and olive oil, salted and more. One of the most popular versions is fried and served in a cono d’asporto (a handy take-away cone, it’s street food at its finest!). Other local seafood specialties include muscoli ripieni (stuffed mussels), calimari, branzino (sea bass), and orata (sea ​​bream), just to name a few. A savory local specialty made from chickpea (a.k.a. garbanzo bean) flour, water, salt and olive oil. 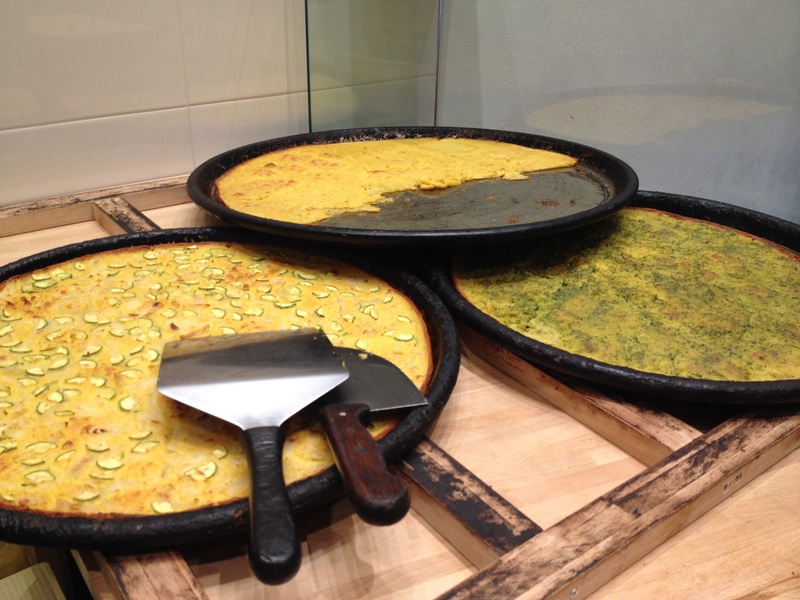 You’ll find farinata sold in the little focaccia places throughout the Cinque Terre. It’s thin and almost crepe-like and while you can eat it plain (do ask for it to be warmed up if it’s not hot out of the oven) you can also find it with toppings. You’ll see most Italians ordering it with either onion or stracchino cheese but some places have become inventive and will offer it slathered in pesto or with other toppings. For some people farinata is an acquired taste. For me, it was love at first bite. This is a popular digestive with locals and once you’re here and see the gorgeous lemons that grow year round you’ll understand why. The ingredients are simple: fresh lemon peel (from local lemons), pure alcohol, water and sugar. Many locals make their own (for their own family & friends to drink) but you can purchase a bottle at many of the shops or simply have a glass after dinner at any restaurant or bar. 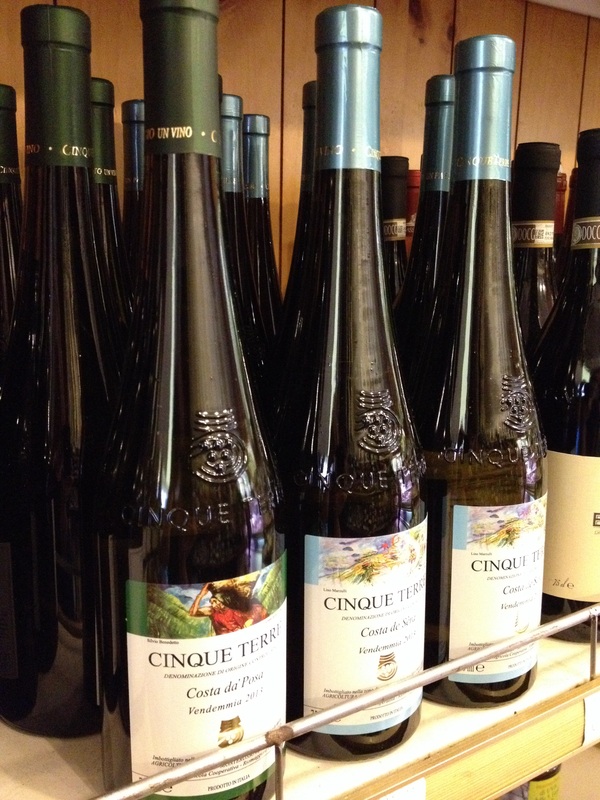 The Cinque Terre is famous for its dry white wine. The grapes used to make the local wine are harvested from the vineyards clinging to the cliffs throughout the Cinque Terre (I recommend going on a hike through the vineyards so that you can really appreciate all the hard work that goes into cultivating the grapes here!). In order to guarantee the authenticity of the origin of the grapes, the D.O.C. symbol (denominazione di origine controllata) should be present on the bottle (that way you know you’re actually drinking the real deal and not just table wine from who knows where). The Cinque Terre is not famous for reds and only in recent years have a few vintners started to offer a Cinque Terre red wine (but this is simply a table wine without the D.O.C. symbol). This is the scarce, prestigious and pricey dessert wine made from partially dried Cinque Terre D.O.C. grapes. The large quantity of grapes required to make just one bottle of sciacchetrà helps explain the hefty price tag. This sweet wine is the pride and joy of locals. If you are offered a glass (or bottle) you should feel very, very flattered! As we say in Italy, buon apetito! This is now my favorite post of your so far. FOOD! Sorry I jumped the gun and suggested you make a piece about food in CT, when clearly you have already done an amazing job with this one. Wow, I think we’ll gain a whle bunch of weight next month when we stay there! Glad to see I’ve got your taste buds salivating! 😉 Not to worry, with all of the walking/hiking/stair climbing, I’m sure you’ll burn those calories right off! Hi, thank you so much for your site. Do you know if any bakeries sell farinata in CT without dairy/eggs, but with vegetable toppings? Wonderful Amy! Zucchini it is — I know it’s ridiculous a vegan is visiting an area known for its pesto & fresh fish. I so appreciate your advice! Awesome, I’m excited to try this place out. I wasn’t sure if the Primo Piatto offered dried pasta anyway as a takeout option, so now we can count on this place. Grazie!! Do you have any information about the ferry in CT? We are staying in Monterosso and would like to hike as far as possible then take the ferry back. The schedules I have seen stop in early September and we won’t be there until the end. I am also wondering if we should make the time to take a ferry to Portofino too. The ferry schedule you are seeking has not been released yet. Not to worry, the ferries run up until the “Tutti i Santi” holiday (November 1st). The Portofino ferry day trip is usually only for the summer months so it might not be happening when you are here. Not to worry… you can still visit Portofino by taking the train to Santa Margherita Ligure and then the bus to Portofino. Thank you Amy. Yes, I have found the ferry schedules are not yet post beyond September 6. I will check back with your website for an update. I think I will play-it-by ear re: Portofino. We are packing a lot in and I don’t want to take away from our visit to Cinque Terre which is only 3 days. Our plan is to leave our rental car in La Spezia but I was unable to make a parking reservation on-line as it required a license plate number. Hopefully we won’t have a problem once we get there. I recommend entering in your license plate number as all Xs (as it’s a given that with a rental car you won’t know your license plate number in advance). 😉 The guests that have done this little trick haven’t had any problems. Hi Amy, do you have a list of genuine nice Italian restaurants in the 5 towns, we are staying in Riomaggiore from 9th September and would like to eat at a number of local outdoor restaurants. In Monterosso you’ll find the highly acclaimed (and pricey) Ristorante da Miky. I definitely recommend reserving in advance and ask for a table outdoors/with a view (if available). The Bakery opposite your office is AMAZING. And Rio Bistrot is our favourite place in Riomaggiore to eat (and offhand where we got engaged). Trattoria dal Billy is a great place for recovery post Beccara trail. 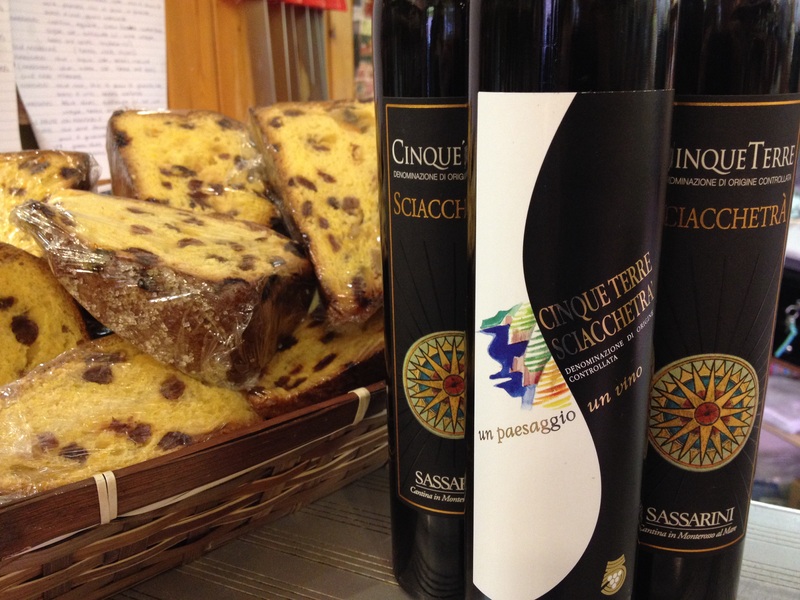 Do you know an enoteca that would be amenable to selling and posting Sciacchetrà overseas? I think the one on the harbour (under Rio Bistrot does but I can’t for the life of me remember the name of it). Please pardon the delayed reply! We just got back to Italy from our annual vacation. Congrats on your engagement! So exciting. What is the name if the sweet bread that is pictured next to the wine in the last photo? It’s amazing! I really liked your page and design. Can you please tell me what theme you are using? Many thanks! Grazie mille, Abhishek! 🙂 Enjoy your time spent here. What lovely compliments, especially from someone in the the travel sector! Enjoy Cinque Terre! It’s hot this time of year so if you plan on hiking be sure to get as early of a start as possible. Otherwise, this is the best time of year to relax and enjoy the Ligurian sea! There’s kayaking, paddle boarding, snorkeling, diving, etc etc.